I always ask my clients if they have any color preferences when discussing a design brief with them – and take them into account when working on a design concept. Then, when I get down to the final design I open my mind to a myriad of colors, influences and experiences that will eventually determine my recommendations and vision for the project. Each and everyone of us responds to the colors around us whether in nature or the built environment, although often not consciously. Its only when we have to make deliberate choices to decorate a space that the task can seem a bit daunting. So, where to start? 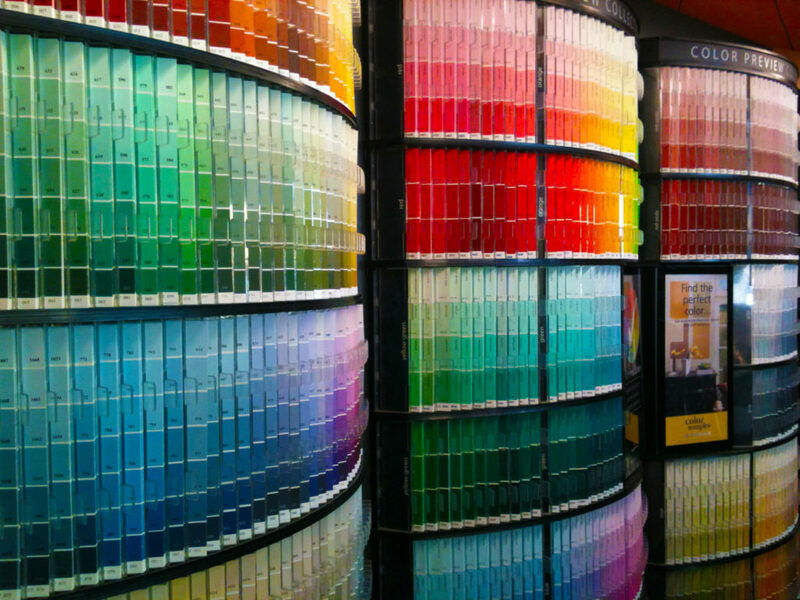 There are useful tools for the interior designer, the most well known being the colour wheel and although I may refer to it and I certainly have colour swatches with me, I tend to work more intuitively and the more experienced I get the more confident I feel at breaking the rules a little if the building or project calls for it. My uppermost thought when I develop a design concept is, how can I produce an appropriate wow factor, and the choice of colors is a major and integral factor. Colors create and influence moods and feelings which is why knowing what the space is used for, who uses it and what emotional impact is desired along with the ethos and business of the company will influence my selections. At a basic level, bold reds are recognised as passionate and daring, yellows are energetic and uplifting, greens soothing, and blues calming and reflective. Different colors will feel warm or cool. Reds, yellow and orange we associate with the warmth of the sun, whilst blues, greens are like the cool sea. Why is it then that a client seeing the finished project for the first time, can be bowled over with what they see? Somehow the colours are made for each other and the overall impression of the space is one of harmony, engendering feelings of positivity and pleasure – or all of the above, but with energy? And now for the technical bit. The color wheel comprises three primary colours (red, green and yellow which can be made up from other colours), three secondary colors (orange, green and violet made from equal parts of two primary colours) and six tertiary colors made from mixing equal parts of a primary and secondary colour) look at the wheel and some relationships that work. Neighbours on the wheel – look at orange yellow and green they create a colorful but relaxing dynamic. Complementary and energetic two hues opposite each other, like orange and blue. Adventurous and slightly quirky three hues evenly spaced on the wheel, such as yellow-orange, red-violet and blue-green bring it on! And a final word. The way I like to work is combining an intuitive, holistic and imaginative approach with a determined focus on the needs and aspirations of the client.